We believe in treating the underlying problems, and are not satisfied with simply treating the symptoms. We will try every technique and approach available to us, reassess your progress often and alter your treatment program as needed. We believe all patients should take an active role in their rehabilitation. You will be educated by our staff and given an individualized home program. Lamarco PT is excited to announce that James Markwica, MS PT has passed the TPI certification test. He is now the only medically certified TPI professional in Saratoga County. Titleist Performance Institute (TPI) is the largest collection of golf-specific health and fitness information from the world's leading experts in the game. They are committed to making their certified instructors thrive in the fitness professional, medical professional and golf instructor arenas. Best of Physical Therapy in Saratoga! Every year, locals to the Saratoga region give their inside advice on the best restaurants, shops, hotels, attractions and more in the Saratoga area. The venues that receive the most votes are awarded the "Locals' Choice" title for the year. The Saratoga Region Locals' Choice Awards are sponsored by Saratoga TODAY Newspaper & Saratoga.com. LaMarco PT is proud to announce they won first place in the business category under physical therapy. 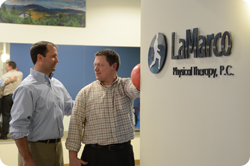 At LaMarco Physical Therapy, we offer traditional hands-on physical techniques in conjunction with the most modern modalities and state-of-the-art equipment. Our therapists are highly skilled in manual techniques to mobilize spinal and extremity joints as well as soft tissue.